In Stock. Generally leaves witin 2 business days. 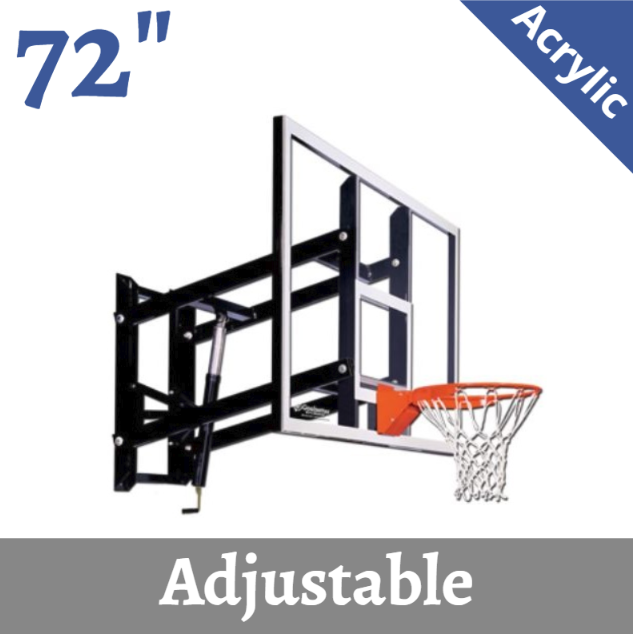 Product: GS72 Goalsetter Adjustable Wall Mount Basketball Goal Hoops - 72 in. Acrylic And Glass Backboard Systems. Shipping included in the price when shipped to the continental 48 States. This system is a great choice if your space is limited and you still want the flexibility of height adjustments. If choosing the adjustable option - a simple turn of the height adjustment handle, this basketball hoop easily adjusts from 6 ft. to 10 ft. or anywhere in between. This listing allows you to choose acrylic or glass. Choose between Goalsetter's Tempered Glass Model and their clear fortified acrylic backboard. Optional Backboard Edge Padding available. Adjustable option allows moving up and down from 6' to 10'. 42" x 72" x 3/8" Regulation size Acrylic or Glass Backboard. 1 1/2" Square Structural Steel Backboard Frame. 3' extension from wall to front of backboard. Corrosion resistant primer / acrylic enamel finish. Nylon bushings at each connection point. Product weight: 225 lbs for acrylic and 285 for glass. Choice of 4 different basketball hoop Rims. Built Tough to withstand aggressive play. 5/8" High Tensile Steel Rim Supported by 3/16" x 1-1/2" supports. 15 Degree Deflection with Auto Return. Angled Guard to avoid injury. Meets or exceeds NCAA & NFHSA Standards. Please note that these basketball systems are heavy units. They do not come with any type of mounting hardware since there are so many different types of surfaces on which these can mount. Competitive Edge Products, Inc. is an authorized reseller of Goalsetter Basketball Hoops. 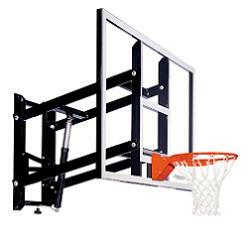 Why purchase an adjustable-height basketball goal instead of a fixed-height goal? Adjustable-height basketball systems allow even very young players to start playing basketball. By the age of 4 or 5 years old, many children have developed sufficient strength and coordination to start shooting the basketball at the goal when the goal is lowered to its lower levels (as low as 6 ft.) for Goalsetter basketball systems. 72 inch backboards are best for developing athletes to help refine their bank shots. 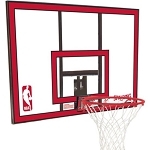 Smaller backboards limit the area a player can use to practice their bank shots. Another use for a full-size basketball backboard is area for rebounding drills. We also carry a large selection of Lifetime basketball systems and Lifetime basketball goals. Last sentence of body text: Volume pricing available for multiple Goalsetter basketball backboards. Q: What is the warranty on this item? A: This item has a five-year warranty against manufacturing defects. A copy of the receipt and photographs of the defect may be required in rare instances of a warranty claim. The manufacturer stands behind their products. Fast Shipping: Orders for the Goalsetter GS72AA generally leave the warehouse within 2-4 business days. Delivery Details: This product ships directly from the warehouse in Lynnville, IA. This item generally ships via a curbside delivery through an LTL carrier (too big for UPS and FedEx). The customer must be present to sign for the order. The freight carrier is instructed to contact you prior to delivery to set up a delivery appointment. Local Pickup Option: This item may be available for local pickup in Lynnville, IA. If you are interested in picking it up locally contact our customer service for a super cheap pickup quote at 866-308-5484. Dimensions: 72" x 42" x 1"